OXFORD, Miss. 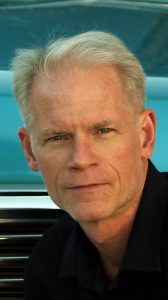 – Adam Gussow, an associate professor of English and Southern studies at the University of Mississippi, has grappled extensively with the devil in his parallel career as a professional blues musician, so maybe it’s not surprising that he’s writing about the devil in blues culture. For more than 30 years, Gussow has recorded and toured internationally with Sterling “Mr. Satan” Magee, a relationship he addressed in his memoir “Mr. 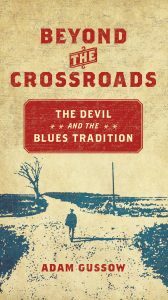 Satan’s Apprentice.” His latest, more scholarly, book is “Beyond the Crossroads: The Devil in the Blues Tradition” (University Press of North Carolina), a survey that occupied seven years of research. In his new book Gussow explores a remarkably wide range of literature, addressing blues songs about the devil from the ’20s to the present, as well as expressions of the supernatural in West African cultures among enslaved African-Americans in the decades between emancipation and the birth of the blues. Barretta: What’s the significance of your title, and what is it that you are going “beyond”? Gussow: People who know nothing else about the blues know about Robert Johnson and the crossroads, and they’ve heard that phrase “the devil’s music.” I wanted to understand that phrase and where it comes from, what it meant to people who use it. And when I looked at the full range of blues songs that evoke the devil and hell, I found most of those are not about the crossroads – there are songs that say “I am the Devil.” There’s the devil showing up in a range of places that have nothing to do with selling your soul, and they’re not just Southern places. Barretta: You also challenge prevailing conceptions of the devil in the blues. Gussow: One important thing I had to do was to figure out to what extent was the devil of the blues the Christian devil, to what extent it shifts from the slavery to the post-slavery period and to what extent African source material is showing up in this blues devil. Contemporary scholars coming from an African-American studies perspective such as Samuel Floyd, in a weird way they’re of a piece with the Robert Johnson scholars – they want the blues devil to be Legba, something inherited from a particular (Yoruban) cultural region. I do make an argument that Legba shows up in some blues songs, but other songs are coming from a very different place. The devil is a shape-shifter, and we should not be surprised that the devil shows up in a number of guises. Barretta: The stereotypical crossroads imagery is of a male in the countryside, but you argue that the notion of the devil in the blues was developed by women in urban settings during the roaring ’20s. Gussow: Victorians were looking down at these young people, the flappers, the lost generation in the aftermath of World War I and saying they’re going to hell. It’s a cynical thing – the devil is a figure that the younger generation takes not as something to be afraid of, but something to embrace, the devil as a kind of master of the revels. What kind of lesson is here? What I argue is that it’s a kind of northern migrant version of the blues idea, that you can create an identity by going bad all the way. But it’s also positioned relative to a conversation about imperiled black female virtue, about what happens to young black migrant women from the South when they get to the big cities. And what’s important about the song is that, on the one hand, she’s voicing it with a kind of sadness, but on the other hand she’s proclaiming it. Barretta: Another use of the devil is political, a coded way of talking about the white man or the system of segregation. Gussow: I argue that this comes from slavery. If you go back and look at the spirituals, what struck me was the concreteness of the metaphors, how the devil was a figure who was chaining you, who was apprehending you in the woods, how these songs were a coded way of invoking the patrollers. And what interested me were the continuities between that and what goes on in the Jim Crow South – you had to maintain the code. I talk about plausible deniability. Barretta: In the fourth chapter, you address how the devil is evoked in response to the new freedoms experienced by African-Americans in the wake of emancipation. Gussow: I talk about the way that the devil ends up mediating post-slavery romance. As Angela Davis says, travel and sexuality become very important themes in the blues, because after emancipation, African-American men and women are free to travel and to choose one another. I say the reason the devil comes into the conversation is because you’ve got freedom. Barretta: You took off your English professor hat and put on the investigative reporter hat to address blues tourism in Clarkdale, notably the genesis of “the crossroads” marker at the intersection of Highways 61 and 49. I thought, when in American history has the devil been invoked favorably in official government documents? I said if it’s gonna happen, it’s gonna happen in Clarksdale in the late ’90s when they’re trying to save themselves using blues tourism and rebrand themselves as the devil’s home in the Bible Belt. 1 – Clarksdale, publication party at Levon’s, 3:30-6:30 p.m.
7 – Vicksburg: Lorelei Books, 4 p.m.
10 – Greenwood: Turnrow Books, 5:30 p.m.